Forget expensive models, the EVGA RTX 2070 Black has everything you need at a much better price. The EVGA GeForce RTX 2070 Black is plenty fast and it delivers a much better value than factory overclocked models. When the GeForce RTX 20-series was announced, everyone was excited to see what the new GPUs would deliver in performance and features. Then we saw the prices and our enthusiasm was greatly diminished. The best graphics cards aren't just fast, they're a great value, and with little real competition Nvidia has priced the new RTX line out of reach for many gamers. The Founders Edition models are a particularly painful pill to swallow, with a $100 to $200 premium over the reference models. But when will we actually see referenced priced cards? The RTX 2080 and 2080 Ti remain largely out of stock, but thankfully the RTX 2070 appears to be doing much better in overall supply. 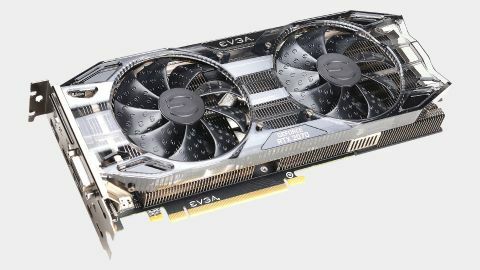 That brings us to today's EVGA GeForce RTX 2070 Black review, a card priced at Nvidia's base $499 and sporting reference clocks. Nvidia supplies the same TU106 GPU to all its AIB partners, who can then bin the GPUs and sell factory overclocked models. These usually carry a price premium, just like Nvidia's latest Founders Edition, but most cards reach similar overclocks. Sure, the binning means the best GPUs may run slightly cooler and hit slightly higher stable overclocks, but that's usually the final one or two percent. That's certainly true of the EVGA RTX 2080 Black, which is within 50MHz of the Founder Edition clocks after tuning. But let's not get ahead of ourselves. Many users won't overclock their graphics cards, so we need to consider both stock and OC performance, with more weight given to the former. This will be a shorter review, as I've already covered everything you need to know about Nvidia's Turing architecture and ray tracing elsewhere (see the boxout to the right). The main question is whether the EVGA RTX 2070 Black is a better graphics card compared to the Founders Edition, and for most gamers the answer is yes. EVGA is one of Nvidia's largest partners, and it's ACX cooling setup has proved capable over the years. The RTX models look similar at first, but there are plenty of underlying changes. For one, the new cooling is called iCX2, and while the Black model I'm reviewing doesn't specifically list that feature, it looks almost identical to the 2070 XC. Also new are the independently controllable HDB (Hydro Dynamic Bearing) fans, which supposedly create less noise and have a longer lifespan (not that I'm able to test the lifespan aspect). There are a few major differences between the Black and EVGA's other 2070 models. It only has a single 8-pin PEG connector, and it's an 8-phase power design. That's enough for 225W with the x16 slot's 75W and shouldn't be too limiting. The other potential drawback (or bonus depending on your perspective) is that the Black doesn't have an RGB logo—or any lighting on the card, actually. If you're trying to put together a more subdued PC, that's sure to make you happy. Compared to Nvidia's Founders Edition, other than the stylistic and aesthetic differences and base clocks, the Black weighs about 200g less and lacks a backplate. I don't know that the metal backplates seen on many cards help with cooling, but I do like the protection it provides to board mounted components. (Yes, I've accidentally killed a graphics card in the past when I damaged a capacitor. That's a very rare occurrence, however—once out of perhaps 100 cards I've used in 20 years.) Otherwise, this is a pretty typical graphics card. My focus with the EVGA RTX 2070 Black will be gaming performance and overclocking. Out of the box, you can expect slightly less performance than the 2070 FE, but boosting the clockspeed by 90MHz (either via EVGA's Precision X1 utility or something else like MSI Afterburner) was a trivial task. I was more interested in seeing how much further I could push the card. At stock, the GPU runs around 1750-1800MHz in most games. After increasing the voltage to "100 percent" (it's not clear what that means—100mV extra perhaps?) and ramping up the fan speeds, I eventually ended up with a +150MHz overclock on the GPU core, and +500MHz on the GDDR6. This resulted in clockspeeds of 1920-1995MHz while playing games. I did need to run the fans at an aggressive 80-90 percent to keep the card stable, however, and backing off 25-50MHz (with lower fan speeds) would be better for the long haul. As for the memory, I didn't spend too much time there, as in most cases the RTX 2070 already has a surplus of bandwidth. You could probably push it to +750MHz if you want, though individual card results will vary. I'm including both the stock and overclocked results for the EVGA 2070 Black in the charts (in green), with the 2070 FE in yellow. The 2070 FE overclocked performance is nearly identical to the EVGA OC results—within one percent in all cases—so I've omitted those for clarity. My graphics card testbed consists of a Core i7-8700K overclocked to 5.0GHz, which is there to minimize CPU bottlenecks as much as possible. Previous Nvidia GPUs were tested with 399.07 or later drivers, and the AMD cards used 18.8.2 drivers. The EVGA RTX 2070 Black was tested with the latest 416.34 public drivers for this review. Most of the games are old enough that drivers and optimizations are pretty thoroughly mapped out, thankfully. I'm using 'maxed out' settings in twelve popular games for my primary benchmarks. That includes all the extras under GTA5's advanced graphics menu (other than superscaling), HBAO+ in The Witcher 3, and so on. Some games punish cards with less than 6GB or even 8GB of VRAM at these settings, but high-end cards like the RTX 2070 will typically be used with higher quality settings. I've also included 1080p medium quality testing, though CPU bottlenecks are often a limitation at that point. Starting at the top with 4k, this isn't the real target for the RTX 2070—at least not without DLSS running at half the resolution. The EVGA 2070 Black manages a respectable 45fps overall, and overclocked it improves to 50fps, which is only slightly faster than a GTX 1080. If you're serious about 4k gaming, particularly at max (or close to max) settings, the 2080 Ti is probably justifiable, but most people would be more than happy for a less extreme setup. 1440p is where the RTX 2070 does best, comfortably delivering 60fps or more in nearly every game. The occasional game like Deus Ex: Mankind Divided or Assassin's Creed Odyssey will dip below 60 and may require you to drop a few settings, but most games are easily playable. Like the 4k testing, the EVGA Black is a bit slower than the 2070 FE at stock, but when both are overclocked it's a dead heat. If you're hoping for 144fps with your 1440p 144Hz display, you'll need to drop the quality in most games quite a bit. Or look forward to the DLSS games, which typically run about 35 percent faster than native plus TAA while delivering similar overall image quality. It's not quite apples to apples, but nearly all AA methods involve some amount of compromise—either in performance or blurriness or other artifacts. CPU bottlenecks, even with an overclocked i7-8700K, become a factor at 1080p—especially at lower quality settings. Breaking 100fps is usually doable, with a few exceptions—some games just aren't made with the intent to hit high framerates. EVGA's RTX 2070 Black continues to do well, and the overclock nets about a 10 percent improvement at 1080p ultra (and 8 percent at 1080p medium). That's a bit less than you could get from reference GTX 900 and GTX 10 series cards (15-20 percent improvements were possible, depending on the specific GPU), and Nvidia appears to be pushing higher average clockspeeds these days, even without overclocking. As far as value goes, all the GeForce RTX cards are high-end offerings, which means they trend toward the lower regions of the charts if you're only looking at the GPU in terms of FPS per monetary unit. Include the cost of a decent PC into the mix and the value proposition changes, with the higher performance cards moving toward the top. Both charts have meaning, depending on what you're after. If you only want to upgrade your graphics card, look at the first three charts. The midrange cards rule the top of the charts, with AMD's RX 570 and RX 580 being particularly good values right now. On the flipside, if you're building a new gaming PC, the latter three charts are more pertinent. There, the GTX 1080 Ti continues to do well, with the RTX 2080 and RTX 2070 also ranking near the top. Either way, as you'd expect, the EVGA RTX 2070 Black rates higher than the 2070 Founders Edition. In my initial review of the RTX 2070 Founders Edition, the $599 asking price was clearly off-putting. Slightly better than GTX 1080 performance for $100 more, after more than two years of waiting? Not so impressive, especially when we continue to wait for ray tracing and DLSS games. The EVGA RX 2070 Black fixes that complaint, resulting in a far more attractive package overall. And if you want the added performance from overclocking, I'm reasonably sure the 2070 Black will handle the same 90MHz bump in core clockspeed without any serious effort. Looking at the GPU market as a whole, however, even at $499 the EVGA card is still only a minor upgrade over a GTX 1080. Yes, real-time ray tracing can look impressive, and DLSS is at least interesting. I do wonder how many gamers would notice the difference between non-DLSS resolution upscaling and DLSS, though. I suppose we need DLSS games to test that with (and not just tech demos), but dozens of games released just in the last year or two have offered resolution scaling. DLSS may do it better, but I'd love to see some double-blind testing done with a bunch of experts to see if we could pick out DLSS vs. non-DLSS scaling. Anyway, that's a subject for another day, just like ray tracing gaming performance. In theory the RTX cards are substantially better than the previous generation GPUs, but we need games—lots of games—using the RTX features before there's any need to upgrade. As an upgrade, you'd need to be running a GPU that's a couple of generations old before I'd say the RTX 2070 warrants consideration. And if you didn't see a need to upgrade to a GTX 1080 or RX Vega 64 any time during the past two years, similar performance with some new "useful in the future" features shouldn't change your mind. Where RTX cards are most practical is with a new PC build, where differences in GPU pricing on a system that costs $1,250 or more become less of a concern. Either way, at the $499 price point, there's simply no point in buying previous generation hardware. You could save perhaps $50 by purchasing a GTX 1080 right now, though with manufacturing of the GP104 GPUs likely stopped, that probably won't be the case in a few months. But even if the RTX 2070 is only 10-15 percent faster on average, it's only 10 percent more money. I'd say go for it. Do you need (or at least want) a $499 graphics card, though? Only you can answer that question, and it's probably best to look at your monitor first. Is it at least 1440p resolution? If not, I'd look at upgrading your display before worrying about an RTX graphics card. While Nvidia's RTX 2070 Founders Edition is a very capable card, it's not worth the price premium—especially not when higher clocked models like the EVGA 2070 XC Ultra beat it on clockspeed and price. It's a mantra I've often repeated in our best graphics card advice: buy whichever model is cheapest, unless there are specific features or stylistic elements you want. About the only thing potentially missing from EVGA's RTX 2070 Black is RGB lighting, if that's your thing. If you're ready to take the plunge on an RTX 2070, the EVGA GeForce RTX 2070 Black belongs near the top of your list. There are two alternatives right now with the same price, the Gigabyte RTX 2070 Windforce and the Asus RTX 2070 Turbo. All three sport the same reference clocks, the main difference being aesthetics and cooling.